I picked this book up expecting it to be lecturey, but I was surprised to find it an engaging and delightful read. I read it quickly, and expect to pick it up again some day. Batchelor begins his story, which is part memoir and part religious history, at the point in his life where he was most committed to Buddhism and yet starting to have doubts about parts of the Tibetan Buddhism he was practising. 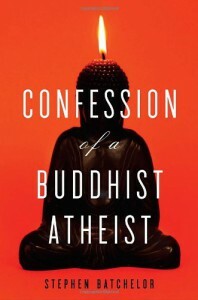 He backtracks to describe how he came to Buddhism, and then elaborates on the problem of "belief" he experienced. His first reaction was to explore other branches of Buddhism, but he found himself unable to escape the requirement of some form of faith in all the sects with which he engaged. This led him to seek out the original writings of Siddhattha Gotama [his spelling], and at this point the book pivots to an account of the life of Siddhattha Gotama and the earliest history of Buddhism, as recorded in the Pali Canons. At this point in the book, I found that Batchelor added life to Gotama's story, and the reader is introduced to him as a human being. Batchelor extracts only the parts of the Pali Canons written by Gotama or (more or less) reliably telling us about his life and the culture he lived in. We learn that many of the beliefs we associate with Buddhism -- most notably the beliefs in reincarnation and karma -- were not actually held or advocated by Gotama. Gotama's Buddhism is less religion and more philosophy, but a very practical one which addresses the problem of human suffering -- and no more. For anyone attracted to the ideas Buddhism but deterred by its religious trappings (and dogma! ), this book is an open door. Batchelor's humility and honesty quickly set a non-lecturing tone, his years spent in pursuit of Buddhist monkhood convinced me of his sincerity, and the story he tells of Gotama's life, which he admits may be biased by his opinions and experiences, seems to be rooted in evidence. The final obstacle I had was a question of cultural appropriation: I'm leery of getting information about Eastern ideas from white (also *British*) dudes. But of course I can only read about Buddhism through English translators and teachers, since I do not read Pali, and it seems that the Buddha intended for his ideas to be shared with anyone, regardless of who they are. I came to appreciate that contemplating the Buddha's teachings and approach to human life is not appropriative, it is what he would have wanted. As a rule I try not to be set in my ways, but it's still refreshing to have my views challenged and my opinions altered, and all the more so when the book is charming and disarming. I would recommend this book to anyone interested in Buddhism.